Juan has spent the last 20 years working as a professional mountain guide. 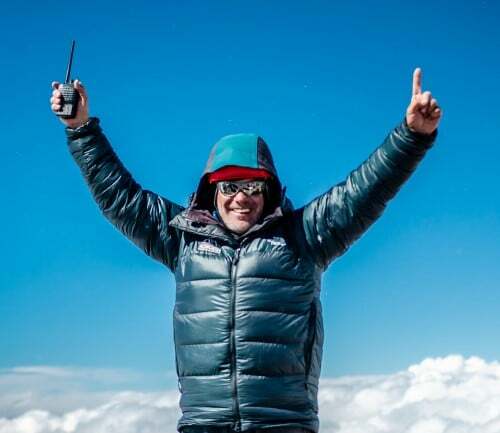 Today, he is one of the most respected guides leading Aconcagua climbs, with more than 45 summits! He is well-known in the local climbing community for his undeniable professional skills and outstanding climbing resume. Additionally, he is a highly regarded teacher (lecturing at the famed Provincial Mountain School) with a unique capacity to pass on his broad knowledge, and has helped develop some of the best guides in Argentina over the last 25 years. Outside his mountain activities, he also works in tourism, organizing outdoor activities all around the province for companies and local leaders. In his limited free time, he is fully dedicated to educating his children in all things mountains and mountaineering. Mercedario (6770 m). San Juan, Argentina. Chopicalqui (6380 m) Cordillera Blanca, Perú. Chimborazo (6310 m) Riobamba, Ecuador. Tocllaraju (6032 m) Cordillera Blanca, Perú. Cotopaxi (5867 m) Latacunga, Ecuador. Ishinca (5534 m) Cordillera Blanca, Perú. Pisco (5497 m) Cordillera Blanca, Perú. Cerro Cuerno (5450). Parque Provincial Aconcagua, Mendoza, Argentina. More than two dozen climbs by different routes in the Central Andes with peaks over 6000, 5000 and 4000 meters in Cordon del Plata such as Plata, Rincón, Vallecitos, Franke, Cerro del Medio, San Bernardo and Lomas Blancas. I was very impressed and satisfied with the expedition. Compared to other guiding companies on Aconcagua, Alpine Ascents seemed to have better food, better/longer acclimatization process, more flexibility in schedule, and the only group to have a permanent base camp at a great location.